Brassinosteroids (BRs) are plant steroid hormones that are characterised by a sterane skeleton of four rings with a number of functional groups attached (mainly hydroxyl). The first species from the Poaceae family in which BRs were found was rice (Oryza sativa L., cv. Arborio J1) – castasterone (13.6 pg g−1 F.W.) and dolichosterone (8.4 pg g−1 F.W.). BRs were also found in corn, wheat, rye, barley as well as Phalaris canariensis L. or ryegrass. There are significant differences between the different cereals in the types of BRs that are present and in their concentration. In agricultural and biological experiments whose aim was to clarify the role of these compounds in cereals, exogenous 28-homobrassinolide and 24-epibrassinolide and less often, brassinolide or other BRs were most commonly used. Recently, however, the number of articles in which BR-biosynthetic deficient mutants or BR-signalling mutants are being used in studies has increased. BR mutants of cereals include mutants of rice (i.e. d61), barley (i.e. uzu) and corn (Brd1). It is worth emphasising that in the case of cereal plants, studies on mutants have confirmed lot of the physiological functions of BRs that have previously been reported in works in which exogenous BR was applied. One can also mention the participation of BRs in regulating plant growth, CO2 assimilation, proline and sugar production, their protective effects on the PSII (under stress conditions) or their participation in a complicated network of connections with other plant hormones. In addition to being a good model for studies of the role of BRs in cereals, mutants of cereal crops can be used in agricultural practice, i.e. to create new dwarf cultivars. 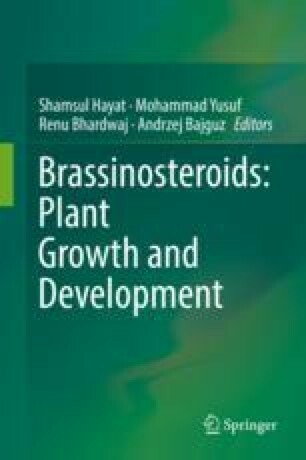 This chapter will review the knowledge about brassinosteroids in cereals – their presence, physiological activity and practical applications. The work was supported by grant No. 2013/09/B/NZ9/01653 (National Science Centre – POLAND).